The Tiger is the National animal of India, and ideally India has the highest number of wild tigers in the world. There are not many tigers left in India, perhaps 4,000, although many conservationists affirm that their numbers may be less than 3,000, due to recently increased poaching. "The tiger is the symbol of power, unbridled, elemental…. And he lives alone, unblemished, unmarred. The more you know about him, the more he gets into your imagination." This is still a rise over the situation in 1973, when Project Tiger was started. At the time, the population was down to 1,800 animals. India's tigers are scattered across the country, and though some national parks have plenty of tigers (the Sunderbans has an estimated population of 270, and Kanha has 102), it's notoriously difficult to catch a glimpse of these solitary, nocturnal animals. Only a few parks offer a realistic chance of seeing tigers, either because park officials track the tigers daily, or because some tigers have become habituated to tourists in 4-wheel drives. Genuine wisdom seems to be that three parks provide the best chance of seeing tigers: Corbett (in the Himalayan foothills of northern Uttar Pradesh), Kanha (in Madhya Pradesh state) and Ranthambhore (in Rajasthan). I did not meet a single tourist who had seen wild tigers in India outside these three parks. In India the Tiger Preserves are called Tiger Parks and they are all related through a massive conservation effort called 'Project Tiger'. 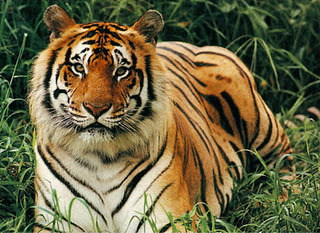 India has a number of Tiger Parks but four of them are the most exciting destinations, and probably the most well known.